Oct.4 and Dec.26 the Strieber family drives from NYC to their cabin in the woods. Both nights there are some powerful lights outside and maybe aliens. The dad is mentally affected by the "bad dream", goes to the shrink and is hypnotized. Whitley Strieber: I see a light go by the window. But I don't want to think about that! When Whitley (Christopher Walken) visits Dr. Freidman (Basil Hoffman), he describes the visitors while watching a salamander frolic in the physician's aquarium. The end credits roll over a night time aerial shot of the Strieber family standing on the shore with New York City behind them. In "Communion," Whitley Strieber's autobiographical book comes to life...sort of. Viewing this movie is a strange experience, and certainly not for all tastes. It is a very cerebral piece of work from a director who did not wholeheartedly agree with Strieber's interpretation of the events surrounding his so-called abduction. Phillipe Mora makes an effort to give the film an air of surrealism, right down to even having the blatant symbolism of DeChirico paintings on the walls of Strieber's home (whether or not Strieber actually had such paintings is beside the point). The director tries to give the impression that Strieber is suffering a breakdown while simultaneously trying to present the events without too much distortion. Tough task...it's easy to see why the film seems diluted and without chemistry. However, this also provides the film with an atmosphere that can also help enhance the whole point, which is not "was Whitley Strieber abducted by aliens," but rather "how did Whitley's interpretation of an inexplicable event effect him and those around him?" One of the last scenes, an exchange between Strieber and his wife in a museum, conveys this point perfectly. "It's just God, masks of God." It can be equated with a religious experience, feeling the touch of God. Strieber FELT the touch of an outside presence. Does that mean he was visited by aliens? This is irrelevant, and I firmly believe that this is what the point of the film should be. 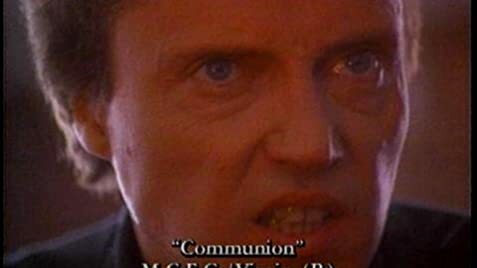 And let's face it, the film is called "Communion," which means "to be at one with God." The mechanics of the film are rather well constructed. Christopher Walken is in fine form as Strieber, giving a wonderful portrayal of a writer on the edge (of a discovery or his sanity?). Lindsay Crouse does a good job as Strieber's wife. The acting is slightly flat in some areas, but this might've been another device of Mora's to add to the surrealism. Constant uses of the New York skyline add a sense of foreboding to the film, not just because of the beauty of these scenes, but because it helps give the impression of an outside presence. The music (with Eric Clapton on guitar) is pretty good, typical of the synthesizer-based scores of most '80's movies, but it adds well to the setting. And even though the special effects may seem laughable, Mora has made the case (perhaps pretentiously) that this was also deliberate. The FOX TV version (which seems to be the version being shown on Showtime Digital Cable) adds several sequences, and increases the light contrast in certain scenes, adding a glowing white haze to many scenes. Some have complained about the scene in the psychiatrist's office being so bright, but I think it also helps get the message that there may be an outside presence surrounding all of us, whether we recognize it or not. 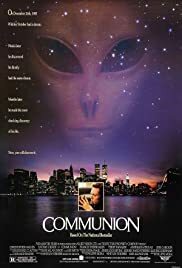 "Communion" is an interesting movie that suffered from a view that was perhaps too short-sighted. If the film were made today, one can be sure the message might have been lost on overbloated special effects, and the surreal effect would've been diminished to appeal to the lowest common denominator of movie-going audiences. No matter what your stance on alien abduction, this is a very thought-provoking film. Give it a chance...watch it. 42 of 45 people found this review helpful. Was this review helpful to you?